NCIS: LA - A Diamond in the Rough - Review: "Expensive Tastes"
We open on a nice dinner party where two couples with indiscernible agents but lovely outfits are interrupted by men in creepy masks. Mask guys hold up the couples at gunpoint, one demanding their jewelry and watches, etc., as the others raid the house. One couple fights back and amidst the scuffle, the husband is shot by one of the robbers before they run off. I’m calling it right now - couple #2 staged the robbery and shooting couple #1 was not part of the plan. Time to set up our subplots of the week: Over at the bar, Deeks and Kensi are interviewing potential bartenders, which basically equates to Deeks making fun of people to their faces for three minutes. Elsewhere, we learn that Callen has recently joined the Nextdoor app (technically they call it something else, but c’mon, we all know it’s Nextdoor,) and honestly, I could watch an entire 10 seasons of a Nextdoor-based TV show. At the office, Nell and Eric are arguing about the fact that Eric ordered a Ticket to Ride game table and that’s amazing because that is one of the best board games, period. Deputy Director Ochoa is waiting for everyone in Ops, which seems to be a surprise to the Wonder Twins and Kensi and Deeks, but they get over their surprise quickly to run down the details of the case. The man shot during the home invasion was Captain Dean Hadlow. The thieves took his laptop, which is concerning since he heads the Navy’s unmanned underwater vehicles and information on that laptop could be invaluable. The other couple at the dinner were Pakistan General Omar Habidi and his wife. Apparently, the men were old college buddies. Callen and Sam visit the house and quickly determine that the robbers used a key, which must mean Habidi set the whole thing up. I CALLED IT! Also, they made that leap very quickly with absolutely no evidence. At the hospital, Deeks and Kensi speak with Hadlow while her husband’s in surgery. She says they hadn’t spoken to the Habidis in years when they suddenly called a few days ago because they were in L.A. and a hotel reservation snafu had left them with no place to stay. She also confirms that pretty much everyone has access to their exterior lockbox containing their house keys, including her daughter from a previous marriage, who isn’t responding to calls about her stepfather being in surgery. At the house, Callen and Sam are talking to Mrs. Habidi who is just SUPER CONCERNED about her stolen necklace but doesn’t seem to care that her husband is missing. Before Sam and Callen can question her for too long, a man from the Pakistani consulate shows up and intervenes on the wife’s behalf. It turns out that her missing husband is a criminal in Pakistan and there’s a warrant out for him. The minute he’s found they’ll return him to his home country and NCIS will have no jurisdiction. Sam and Callen start to think that maybe this whole thing was actually drummed up by the Pakistani government in an attempt to get Habidi and the stolen Naval technology with no questions asked. Meanwhile, Deeks and Kensi have made their way to a swanky mansion swarming with wannabe Instagram models, which happens to be where Nell and Eric located Hadlow’s stepdaughter’s phone. I love Eric and Nell’s commentary on the stepdaughter’s social media habits. They don’t need a warrant because “…Everything you need to know about her has been conveniently broadcast online.” And that’s why you don’t have public social media accounts, y’all. Anyway, Deeks heads in, armed with a camera. He snaps some shots of the pool party behind the mansion and quickly attracts the attention of the wannabe Instagram famous attendees. Kensi - whose legs are absolutely amazing in this scene, btw - fake-flirts with him and poses for some shots as he focuses on what’s in the background - Emily Conway arguing with some guy. Eric and Nell use Emily’s very open social media accounts yet again to identify the guy as Lucas Walker, who has a connection with some shady dudes. They deduce that he must be behind the robberies and after a quick conversation that land Lucas and Emily in the pool, Kensi and Deeks bring them in for questioning. Sam and Callen trace Habidi’s rental car and find him standing out in middle of a park. Pretty obvious, dude. They see a guy approaching him with a gun and yell out, announcing their presence way too soon, and have to split up to chase the two men. It quickly escalates to a shootout in a very public place - which isn’t good - and take Habidi down. Robert Fenton from the state department shows up and claims he’s protecting General Habidi, who is working with them to provide information on the location of five Taliban camps. Which is why Pakistan is after him - Habidi wanted to defect quietly, but now he’s caught his government’s attention. Habidi says the Taliban info is on his smartwatch, which was taken in the robbery. Fenton and Ochoa put a major time crunch on the team since their jurisdiction is about to run out. At the boat shed, Kensi and Deeks are interviewing Emily and Lucas. The couple refers to Lucas as “One Direction,” “NSYNC,” “Backstreet Boy,” and “Harry Styles” at various moments throughout the interview, and it’s great. Although let’s be honest, any of those nicknames could apply to Deeks, who is rocking a much more boyband-friendly hairstyle and is a full decade older than Lucas. It comes out that Emily knows absolutely nothing of the robbery and even less about her stepdad being in the hospital, which means that Lucas is behind the whole thing. He knew about the dinner party and saw it as a quick get-rich opportunity because - get this - he wants to take care of Emily but she has “expensive tastes.” Sure. You robbed her parents and shot her stepdad so you could take her out to nice restaurants. Okay, then. Lucas gives them the name of the guy he sold everything to - Harry Freedman. When the team breaches Freedman’s house, they find a dude in his pajamas sitting on his computer, selling stuff online. 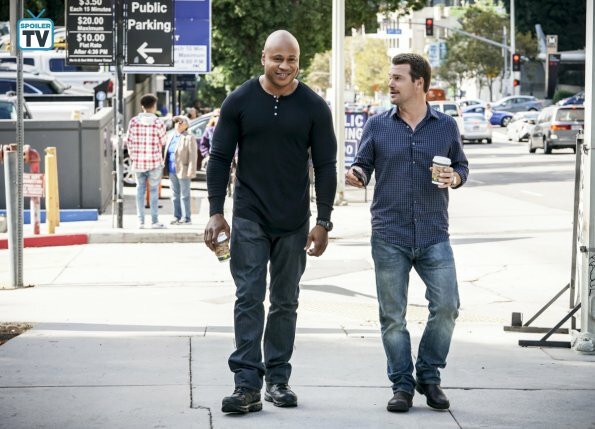 The laptop and smartwatch are recovered and sent immediately to Callen and Sam, but it’s apparently too late to stop Habidi from being sent back to Pakistan. Not one to give up so quickly, Nell does some magic on a burner phone they found and discover that the person behind all of this is - drumroll, please - Rebecca Sadat, assistant to the Pakistan Counselor. I’m gonna be honest, I’m not 100% certain how she figured it out, but I watched this scene several times and it still didn’t make sense, so I think we can just move on. Sadat is the one driving Habidi to the airport. They discover that Sadat was surrounded by the Taliban as a child and was most likely brainwashed and raised to infiltrate the government as an adult. Time for everyone to pile in their cars and chase Sadat down! Kensi, it should surprise no one, is driving like an absolute crazy person and Deeks is IN. TO. IT. He does keep saying “I should’ve drove,” which is so completely grammatically incorrect it distracts me from the hilarity of the next moment, which is him being so turned on by Kensi’s crazy driving that he proposes again and asks to get married right then. The hot crazy driving soon turns scary crazy though as Kensi straight-up plays chicken with the van. Callen and Sam are behind Sadat and once she realizes she’s boxed in, she pulls over. The team takes everyone out as they stream out of the van, but Sadat comes out holding Habidi’s wife hostage. She then reminds them she has diplomatic immunity. It is just unbelievable how much TV characters get away with because of diplomatic immunity. Is it like that in real life? Habidi gets out and gets on his knees, pleading with Sadat to spare his wife. She lets her go and Callen shoots her, taking her out. Which… I’m sorry. This is someone who has been brainwashed by terrorists as a child and you think begging her on your knees for five seconds will suddenly make her reconsider her ways? That’s… a little unbelievable, too. Wrapping up now. Hadlow is out of surgery and the state department is going to find a place for Habidi to live. The dang necklace that is somehow so important still hasn’t been found, the US has the info on the five Taliban camps, and Kensi looks amazing in those jeans. Did she just do a killer leg workout before this episode or something? As Sam and Callen drop the Habidis off, we learn that the necklace was so valuable to the wife because it once belonged to their daughter, who was killed years ago by the Taliban. Okay, now I feel bad for making fun of how important it was. It’s a sweet reminder that out of everything that was taken, that one dollar necklace was more valuable to that couple than anything else. Kensi and Deeks head back to the bar for a post-case drink and I’m ready for Hetty to come back. WAIT MAYBE HETTY IS IN THE BAR, WAITING FOR THEM, WANTING TO BE THE BARTENDER! OH MY GOSH, THAT SHOULD HAPPEN. The couple banters about how glad they are they didn’t grow up in the era of social media - I agree - when a voice interrupts. OH MY GOSH IS IT HETTY? It’s not Hetty. It’s Deeks’ mom, and she wants to be their new bartender. Okay, I can get on board with this idea. Kensi is also on board INSTANTLY and Deeks, seeing he’s outnumbered, finally gives into the idea of a trial run.